Unionville Elementary students Madeleine and Holly Cameron honor their dad, John Cameron, at the Veterans Day assembly held Monday at Unionville Elementary School. EAST MARLBOROUGH – Members of the Color Guard of American Legion Post 491 processed into the auditorium of Unionville Elementary School this Veterans Day to pay tribute to those who serve our country. They were joined by students, staff, and veterans as part of Unionville Elementary School’s Veterans Day assembly recognizing those who have sacrificed their lives for our country. 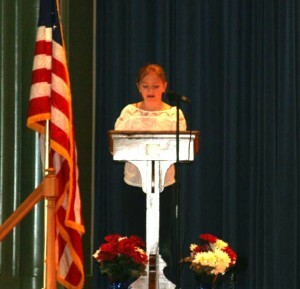 Kylie Harlan, a fifth grader at Unionville Elementary, led the Pledge of Allegiance during the Veterans Day ceremony. This was followed by the Unionville Elementary chorus group singing the Star Spangled Banner. 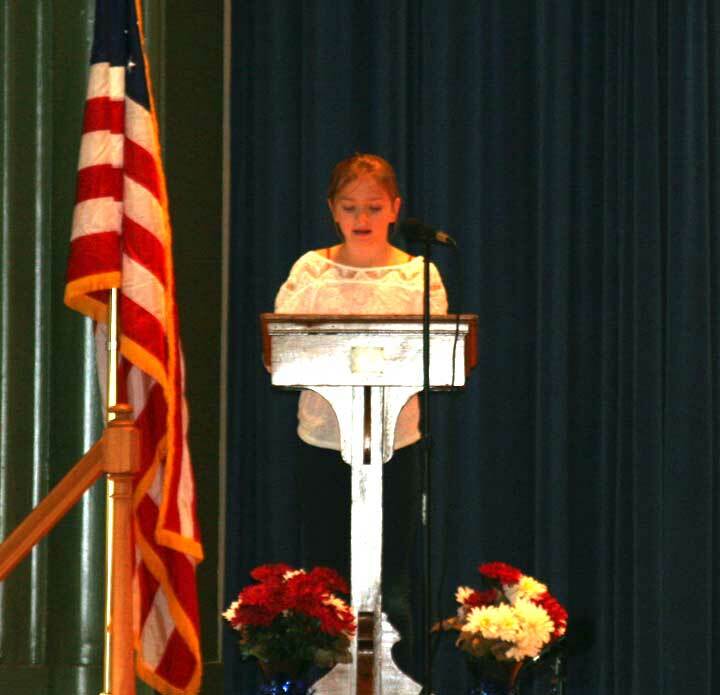 Fifth grader, Kate Holmes, spoke about the history of Veterans Day, highlighting how Veterans Day honors all veterans – those living and deceased. The tradition of honoring those who serve our country dates back to 1919 when President Woodrow Wilson proclaimed November 11 as Armistice Day to remember those who died in service to our country. In 1938, Armistice Day became a legal holiday – a day dedicated to world peace and primarily to honor veterans of World War I. In 1954, the name was officially changed to Veterans Day, and November 11 became a day to honor American veterans of all wars. In 1954, President Dwight D. Eisenhower issued the first Veterans Day proclamation. Unionville Elementary School fifth grader, Kate Holmes, talks about the history of Veterans Day at the school’s special assembly. 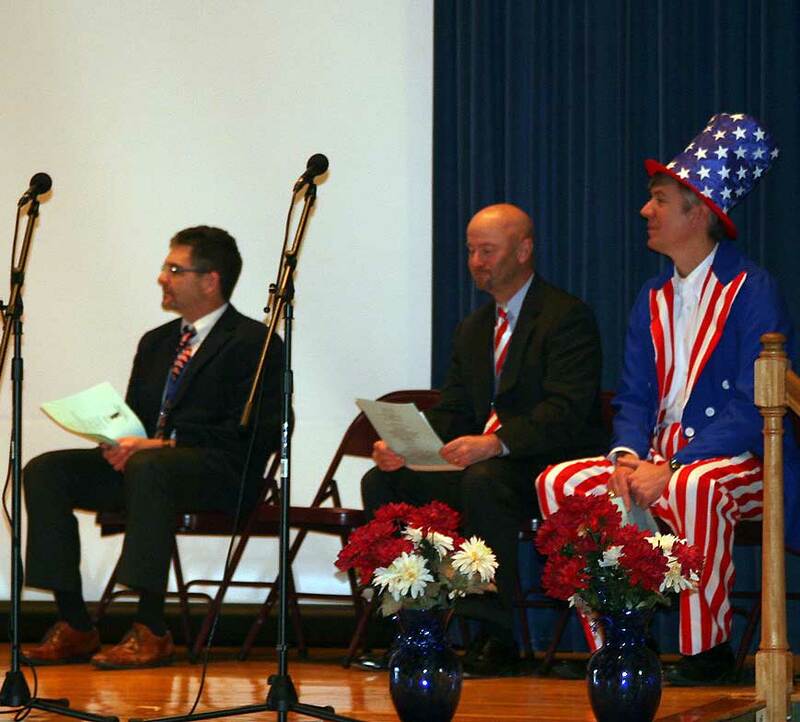 During the assembly at Unionville Elementary, Dr. John Sanville, Superintendent of the Unionville Chadds-Ford School District, read the 2013 Veterans Day Proclamation issued by President Barack Obama. “This year, in marking the 60th anniversary of the Korean War Armistice, we resolved that in the United States of America, no war should be forgotten, and no veteran should be overlooked,” says Sanville as he read this year’s proclamation. 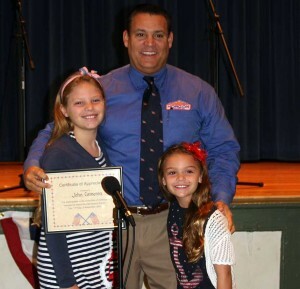 The highlight of the Veterans Day assembly was the presentation of certificates to students’ families and friends who served in the military. Boys and girls of all ages honored their loved ones by recognizing their years of military service and describing their role in keeping our country safe. Unionville-Chadds Ford School District staff join students in paying tribute to those who serve our country. 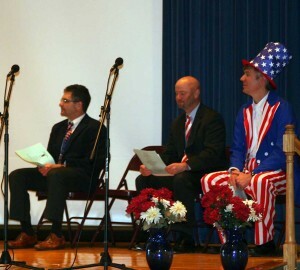 Pictured from left to right: Clif Beaver, Unionville Elementary School Principal; Dr. John Sanville, Superintendent; Ken Batchelor, Assistant to the Superintendent. Even Uncle Sam made an appearance to personally distribute the certificates to our military servicemen. After the ceremony, veterans were treated to lunch prepared by the school’s Parent Teacher Organization. The Unionville Chadds-Ford School district has been honoring veterans on this special day for the past 12 years. It all started when former fifth grade teacher Don Silknitter realized that many of his students didn’t know much about Veterans Day or about the role veterans played in securing our country. Silknitter was determined to change this so he organized the first Veterans Day celebration in his classroom. Today, Unionville Elementary is just one of many schools in the Unionville Chadds-Ford School District honoring veterans on this special day. Why weren’t any of the people from the school that organized it mentioned in the article? They worked really hard and do it for the veterans, but sad that they weren’t recognized. Thanks to our 3rd grade teacher, Mrs Oldenski who coordinates this event every year! Without her, this beautiful ceremony wouldn’t take place. All of our veterans enjoy and appreciate the time, effort, and recognition. Thank you Mrs Oldenski and thank you veterans! The first Unionville-Chadds Ford Veterans Day Program was first held in 1996. Since the first program, involving one class, it has grow to include every elementary school in the district. Well over a thousand veterans have been recognized to date. Many of them are no longer with us today. I thank the district staff for continuing the tradition since my retirement. God bless our veterans!